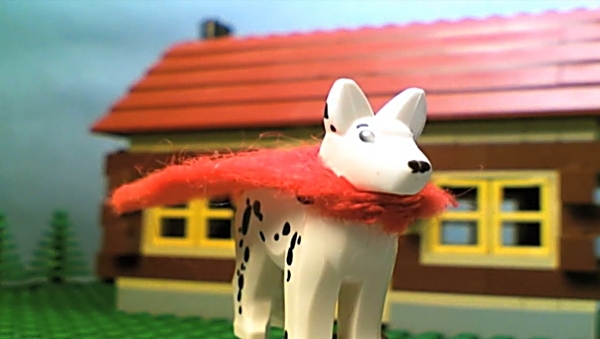 At BIAFF 2015 Jacob Crow won 4-Stars and an Imagem Music Award with Superdog. As most know, animation is certainly the longest form of filmmaking, and stop motion is the longest of the long. I was first approached with the project by Helen Ward, the director of the Kids For Kids UK film festival, in the latter half of March 2014. I had first entered one of my short films into her competition in 2011, and ever since she and the rest of her team have been incredibly supportive of me and the work I’ve done. A new VUE cinema had recently opened in the town of Cramlington, and to celebrate the one-year anniversary of its opening, they had worked with the local primary school. Each of the students was tasked with developing a simple storyboard and plot synopsis for a short they’d like to see. The cinema chose a handful of the best ideas, and handed them over to Helen, who brought the project to me and two other filmmakers. 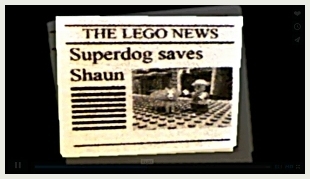 Each of us looked through the dozen-or-so story plans, and I saw potential in a brief idea by Shaun Fantozzi, a pupil from year 3, aptly entitled ‘Superdog’. From this very brief outline, I began to develop a script, and when I was happy, Kids for Kids and VUE Cinemas approved it and I set to work. I have been working with Lego since about 2010, and I haven’t really strayed too far from it, other than a few minor projects. I saw this as an opportunity to break away from my traditional use of animation, but they were very particular in that each of the three films display a different ‘style’: 2-D drawn animation, 3-D plasticine animation and my own ‘brand’ of Lego animation. In the end, this was definitely the best option - a project such as this should not have been a chance to experiment but rather to stick with what I was good at and hopefully develop some of those skills. So, with the script complete I set about animating the short film as I would any other. I downloaded various pieces of music from the popular site, Incompetech, and composed them as I saw fit, making sure the cues did not surpass the 3-minute target. 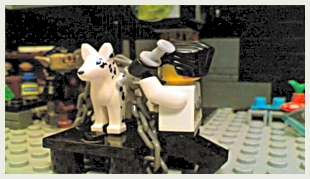 Then, I arranged my Lego bricks, and built up the sets that I would need to use in the films. Though I can’t exactly remember all the details, these sets included a suburban street, a mad scientist’s lab and various streets. The collection I have amassed over the years is considerable to say the least… Other than that, I daresay my set-up is all rather basic. A lot of how I made the film consists of whatever I had at the time. The lights I used were just your standard IKEA lamps. The camera I used was a cheap little webcam from Amazon. Looking back now, nothing there seemed to be in high definition. But nonetheless, it’s the set-up I had and I made do. I wouldn’t say animating with Lego made the process any harder. I’m just so used to animating with those little plastic figures now that animating with actual puppets is incredibly difficult for me, as I think is evident with one of my other films, The Farmers - BIAFF 2-Stars - (which, as an aside, was the very first time I had used such armatures for filming). That being said, having animated with Lego bricks for nearly 5 years, I thought I was pretty good at it, having developed various skills and such, taking onboard feedback from others. As most know, animation is certainly the longest form of filmmaking, and stop motion is the longest of the long. So films like these can take anywhere between a week and a month to make, whereas a live action shoot may only take a day or two. Superdog itself took, I think, 2 months, but some of my other projects have been known to take (off and on) half a year or so. Some techniques are much more particular - in the film, Superdog flies around a lot, and this was a culmination of various techniques. In some instances, I animated him against a green screen and in others I used a process called masking, in which I film the dog propped up by a stand, and remove the stand in post-production. I finished the film, and sent it off for review, and thankfully the cinema staff enjoyed it. It was screened later that year in July, and has since enjoyed success at other young film competitions, such as the Berwick Film Festival in which it took the Chris Anderson award. I’m amazed by how well its doing within the competition circuit, but I’m no less humbled nor honoured to receive such recognition. Superdog is a film that I’m proud of, and I’m very happy to have been awarded 4 stars and an Imagem music award at the BIAFF.